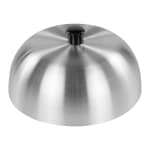 The Carlisle 60103 burger cover retains flavor and moisture in meat on an outdoor grill or kitchen grill tops. A bakelite knob on the top stays cool to the touch to protect the cook. The rest of the cover is constructed of corrosion-resistant aluminum. "Would like a larger size if available."